The AcoustiTECH membranes are installed in multiple high-end buildings all around the American continent to achieve superior soundproofing. It is possible to find them in new constructions, but also in renovated buildings. The building structure can either be made out of wood or concrete, the floors can be glued, nailed or floated and they can be made out of wood, vinyl, ceramic and much more! The Sillery Woodfield is a high-end condominiums building. The six-storey building counts 62 units. They each have nine-foot ceilings. The AcoustiTECH 7000 membrane was used in a double-glued wood flooring installation. The Quartier QB is the biggest condominiums project in Quebec City right now. It includes commercial stores on the first floor. The AcoustiTECH VP membrane was installed all around the building under a Torlys floated vinyl flooring that has a cork backing. The Fairmont Queen Elizabeth hotel was renovated with the AcoustiTECH Lead 3.3 membrane. It was installed in a double-glued wood flooring installation. 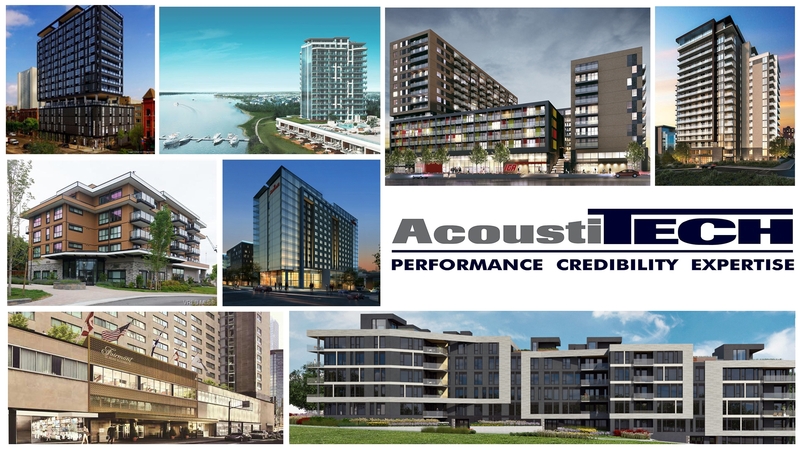 Further north, in Laval, the first phase of the Aquablu, a new condominium building, has been soundproofed with the AcoustiTECH Lead 3.3 and AcoustiTECH Ceramic membranes. The structure of this building is made out of concrete. On the Ontario territory, the AcoustiTECH VP membrane was installed in The Bowery Condos in Ottawa. The concrete structure has 18 storeys with 248 units. As mentioned above, the AcoustiTECH membranes can also be installed on a wooden structure with no concrete. That’s what was done in Victoria, British Columbia, in a condominiums building, the Travino Royal Oak. The Acoustiboard, the Insonofloor as well as the Acoustivibe acoustic solutions were installed in the six-storey building that is divided into 52 units. A second phase is still under construction. The Mariott Capital District and the 400 West Huron are 2 buildings located in the United States. The first one is a hotel and the other one is a condominiums building. The Mariott Capital District is a hotel located in Nebraska. It is made out of concrete and counts 346 units. The AcoustiTECH LV membrane was installed under the vinyl flooring. The 400 West Huron, a fifteen-storey condominium building in Chicago, is also made out of a concrete structure. It has glued engineered flooring under of which an AcoustiTECH Lead 3.3 membrane was installed. Whatever your project is, AcoustiTECH advises you on the acoustic solutions that best fit your building structure, your flooring type and, especially, your budget. The support from our team all along your project, even on site, gives you a great peace of mind. For a superior acoustic performance that will increase the value of your project, let the AcoustiTECH expert team guide you! Contact us.